It seems that many perceptions of the Maidan-uprising and the internal dynamics inside and outside the Ukraine are twisted or wrong, especially concerning the aims and direction of the movement, the involvement of the left and the role and importance of the extreme right. The reaction of the left outside of Ukraine has been hectic, superficial, paranoid… to say the least. There are no strong links between the left in Ukraine and other countries (maybe except for Russia), so many left commentators relied merely on the media propaganda. This report aims to clear up misconceptions and explain what is going on. These are notes from discussions with activists of left-wing groups in Kiev in April 2014, including members from the Autonomous Workers’ Union, Left Opposition and Student Direct Action, as well as visits at Maidan. This is not a full account of all aspects, but a report of what we heard from the comrades and on the street. Left-wing activists were surprised that the uprising was able to get rid of Yanukovich “so fast”, since they expected more repression and a longer struggle even after the sniper killing of dozens of protesters in mid-February. However, internal and external reasons led to the regime-change. After the last presidential elections in 2010 Yanukovich’s group had concentrated more political and economic power, appropriating large parts of the economy and threatening the position of other powerful oligarch clans. So his rule did not fit the interest of the capitalist class in Ukraine as a whole but just one corrupt family. Many oligarchs turned away from Yanukovich and supported the opposition parties and other protesters because only a regime-change could bring back their profits. The Yanukovich-government also failed in finding a solution for the economic crisis. Due to the rivalry between the two main power groups in the ruling class social welfare had not been reduced in the same way as in Russia and other Eastern European countries in the past two decades. The Yanukovich-government attempted to cut state expenses, e.g. with a pension reform, but was not successful – and feared social unrest. It desperately looked for financial support, switching back and forth between closer relations and promises for financial support of either the EU or Russia. Both offered credit on the condition of more political influence and the opening up of the Ukrainian economy for foreign investors. Yanukovich’s manoeuvring alienated some of his supporters from the economic elite and surely many ordinary people in the Ukraine. What made people in Kiev and later in other parts of the country, especially in Central and Western Ukraine, demonstrate was not just the promise of a better life if the country moves closer to the EU, but also the fear of a situation similar to Russia with its increasingly authoritarian politics illustrated by the de facto one-party rule, the strict control of demonstrations, homophobic laws and more. Closer ties to Russia seemed to mean less personal freedom and a stronger state under the control of the corrupt political elite and the oligarchs. The Maidan-movement went through several phases. The first phase started with pro-EU demonstrations and the occupation of Maidan in late November 2013 after the Yanukovich government refused to sign the association agreement with the EU. After police attacks on the protesters it continued in the second phase with anti-repression demonstrations in December. 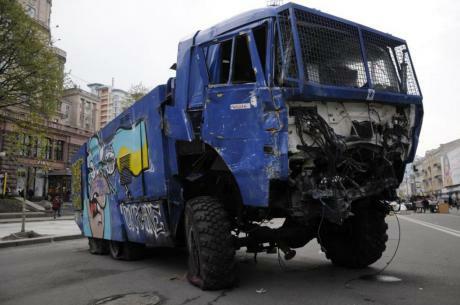 The third phase of barricade struggles and attacks on activists by the police and government-sponsored thugs (Titushky) started in the second half of January 2014 when the Yanukovich government announced new anti-protest laws. The movements culminated in the forth phase with fierce struggles and the killing of dozens of protesters in mid-February. During the fifth phase at the end of February Yanukovich government collapsed and the opposition forces took over power. The sixth phase is still continuing, as the protest camps on Maidan still exist (with the presidential elections in May in sight) and demonstrations against the Russian aggression and other issues continue. According to our interview partners, the majority of the people on Maidan were driven by social issues, including poverty and low wages, corruption, police-violence and repressive laws. However, social demands were not expressed as such, and when some used respective slogans they were kicked out and called provocateurs by people from the opposition parties or rightist groups who streamlined the movement with general slogans against corruption, the Yanukovich-government, tyranny etc. The Maidan self-defense was organized in “groups of one hundred”, with organizations or currents setting up their own group. All together there were about fifty such groups of one hundred. However, despite the name many groups were made up of not more than thirty or forty people. About ten groups were dominated by rightists or fascists, others expressed nationalist tendencies but with more liberal or democratic elements. Later, some used the term “group of one hundred” for other self-organized activity: women, artists, anti-corruption activists, and so on. During the movement many people from Kiev came and donated food – there was even a joke among demonstrators that they gained weight during the movement. Other support came from various organizations and the elite, like medicine. On the weekends the composition changed, with the population of Kiev coming to the rallies and demonstrations. The majority of protesters was not organized and had no political background but engaged in the discussions, favoring equality, freedom, expressing hatred for the police. This did not lead to a general distrust for any (state) authority, though. In the early stages of the movement the ordinary participants on Maidan did not trust the politicians of the opposition parties – “All of them have to leave” – but that changed to a certain extent later. Workers came to the demonstrations and took part in the Maidan groups, but not organized through any unions. When the leader of the Confederation of Free Trade Unions of Ukraine (CFTU), Volynets, announced a general strike, nothing happened. The composition of protesters in other cities was diverse. For instance, in Dniepropetrovsk and Kryvyi Rih (Central Ukraine) miners from the CFTU were involved in the Maidan protests there, in Charkiv (Eastern Ukraine) the protest was in the hand of leftists and liberals. The coordination between different Maidans was generally weak, but strong between Lviv (Western Ukraine) and Kiev. When we visited Maidan in early April, it looked like the setting of a historical movie, with many barricades still there, army tents on the street, candles and photos of the people who got killed. The burned trade union building was decorated by artists with pink paint-bombs. There were stands selling “revolutionary souvenirs”, calendars, badges, door mats with the face of Yanukovich etc. On the walls graffiti and street-art of all kinds, from fascists and anarchists, and many A.C.A.B. (all cops are bastards). Many groups had posters with their “martyrs” on the tents. Activists from outside of Kiev still live there. Many men wore army uniforms and bullet-proof vests – not just from the fascist Pravy Sektor, but also from “moderate” groups like the conservative-liberal Spilna Sprava, Samooborona, or the nationalist-anarchist Narodny Nabat. Some of them admitted they were participating in military training – including the use of weapons. Some buildings were still occupied by groups like C-14/Svoboda and Pravy Sektor. Around 1,500 protesters were still holding out on the square, mostly men, some women. Some of them had been there for four months, day and night. We talked to some of them who came here from small villages near Lviv, peasants, forests and construction workers. They youngest was 27, the rest in their forties. They belonged to an anti-corruption group and Samoobrona and said they will stay until the election in May. For them, the old and new governments are both corrupt. They think the situation got worse because people lose their jobs. None of them had been to the EU, but some had worked on construction sites in Belarus and Russia. One of them said they did not get their full wage after working in Moscow. Celebrating one guy’s birthday and drinking vodka despite the alcohol ban on Maidan, they proudly showed us photos showing them posing with guns. All left-wing activists said that the fascists or radical right wingers did not dominate the movement nor represented a big part of the protestors. They did describe fascist attacks on themselves and how they were excluded from the barricades, but that was rather a result of their own weakness then of the strength of the fascists. The mass waving of Ukrainian flags or chanting nationalist slogans were not signs of fascist or radical right wing ideas. Some protesters also had a blurry understanding of nationalism, expressing that for them it was fighting for a free world. Racism or ethnic nationalism did not seem to catch on. Before Maidan the biggest right-wing force was the Ukrainian nationalist party Svoboda (in parliament) with their fascist “youth organization” and militia C-14, with several fascist groups even further on the right (outside parliament). Pravy Sektor was founded by several fascist groups including paid activists and football hooligans at the beginning of the Maidan movement. One of these fascist groups (White Hammer) was later excluded after it had killed three policemen at the outskirts of Kiev. Not all fascists took part in Maidan, some also supported Yanukovich – and, of course, the Russian nationalist fascists did not take part either. They are active now in the separatist activity in Eastern Ukraine, for instance, showing the black-yellow-white flag of the Russian monarchists or national-bolshevik banners. Most of the fascist leaders on Maidan were from the middle class and intellectuals, their infantry consisted of many students, and there were few workers or farmers. The fascist intervention on Maidan seemed like a contradiction from the start, since many of the main issues were liberal or left, like pro-democracy, for EU-association, against corruption, against police-violence, etc. These are topics the fascists do not represent, so their standing among the protesters was not based on their political program but their ability to organize the struggle against the police. When rightists attacked unionist or left-wing activists on Maidan in November, others supported that because everyone “communist” was identified with the Communist Party of Ukraine (which supported Yanukovich). However, even when the Right Sector led the struggle against the police in January, it constituted a rather small group. At the end of January, beginning of February, the rightists were most popular at Maidan – after they led the fight against the Berkut riot police. According to one of our interview partners, that was a “scary” moment. Leftists, journalists, and people with dark skin were attacked. C14 beat up a left activist who brought a banner “Against the Police State”, only to hang the banner on a building occupied by them later. However, after that facts on the criminal past of the fascists and their leaders became public, and people did not like that. When Pravy Sektor leader Yarosh met with the Yanukovich government during the days of the killings of protesters in mid-February the group lost a lot of support. After the regime-change some fascist groups have engaged in criminal activity, e.g. stealing money donated for the Maidan protests. When the police killed one of the Pravy Sektor leaders there was little protest. In provincial towns Pravy Sektor has recruited parts of the local criminal gangs. It also formed a party for the presidential elections but according to surveys it has only the support of around one percent of the voters. “The rest of the population either thinks they are idiots or thinks they are foreign agents.” Other fascist groups have gone back to fighting each other. C-14, so far linked to the party Svoboda and very active in attacking left-wing activists, recently got into conflicts with the Svoboda leadership which they view as too “moderate.” Svoboda itself has been less popular after the Maidan uprising than before. It lost a lot of support, especially in Western Ukraine where they were in local governments for years and showed that they are as corrupt as the other parties. Svoboda leaders are involved in drug-trafficking and even have business relations with the CPU. It plays a secondary role in the new government, and its weak performance there cost them support. So on one hand the high point of popular support for the right is over, but the fascists have lists of people they want to kill, especially from the old left. No one was murdered so far, though. They have more members and more firearms, but no strong popular support. Still, the fascists are often still tolerated, for instance, when distributing leaflets on the Maidan and not widely stigmatized. At least, while before the Maidan-movement antifascist activity was just a thing of the leftists, after Maidan also some liberals, intellectuals act against extreme nationalism. In the past, the police never acted against fascists even after violent attacks against leftists, now it started to act against them, since the new government sees some of them as dangerous and uncontrollable elements (and the police hates the fascists). On the other hand, part of the police is disintegrating, their trust in the government being weak, and with the unclear political situation they fear retaliation. In Eastern Ukraine many also defected and joined the separatists. There was little space for the left on Maidan between the big stage (controlled by the political parties) and the buildings and barricades controlled by the right. The left-wing groups agreed that the Yanukovich government had to go, and they supported the fight against corruption and police-violence. It did not play a big role, though. The left is generally weak in the Ukraine. It is generally discredited by the history of Stalinism, but also the recent support of Yanukovich by the Communist Party of Ukraine, which is socially conservative and pro-Russian. Other groups in Kiev consist of “intellectuals”, have only a few dozen activists, and there are only small sections of Antifa and left-wing hooligans. The left is divided along similar lines as elsewhere: Borodba, a Stalinist organization, started in 2011 as one split off from the Organization of Marxists. After three Borodba-activists were beaten by the fascists on Maidan it turned against the whole uprising and defamed it as fascist, taking a view similar to that of the Russian government. Another split off was Left Opposition (LO), a Trotzkyist organization, which was joined by other leftists. Already in 2008, a student organization was established: Direct Action (DA), started by Anarcho-Syndicalists. Before the Maidan-movement, it was involved in the mobilization of demos of thousands of students against university fees and the reform of higher education. The Autonomous Workers Union (AWU) was established in 2011 as an attempt to get away from mere political activism and get involved in class struggle. It organized a campaign against the new labor law. At the beginning in November many leftists, including anarchists and feminists, got involved. A group of about thirty activists visited Maidan to participate and agitate and set up a left-wing group of one hundred. They were attacked by fascists, once because Left Opposition took a red flag, another time because feminists had banners on equality. The leftists were too few and could not enforce their open participation in the movement. The attacks were carried out by C-14, the Svoboda militia which was well prepared for this because already before Maidan they had made lists of left-wing activists and knew many faces. Afterwards few leftists including anarchists fought on the barricades (where they were attacked and kicked out be the rightists); instead they got engaged in other ways. At first, about 300 students from the Student Assembly went to the Ministry to demonstrate in the afternoon of February 21 (one day after the high number of killings at the Maidan, and the day Yanukovich disappeared). They were determined to break down the fence and enter the yard but found the gate open, went in and demanded to speak with the minister. He was not there and his deputy said he could not contact him. The deputy called the police, but on that day the police was not prepared to intervene. The students got angry and went into the building. They stayed in the conference room and on the corridors but did not go into the offices. Employees ran away, and some tried to take files. The students declared the building occupation and informed the Maidan coordination, and food and water was sent from there. About ten people (anarchists, communists, socialists) acted as the self-defense forces who guarded the building. Some Nazis came at the beginning, but they were not interested as there was no money and nothing important for them. The self-defense group then blocked the gate. After employees tried to get files and destroy them, they were locked out, and only students showing their card were allowed in. “The Ministry belongs to the students.” About 200 students (a changing composition, as students came and went) stayed there for a week, at night sleeping on benches in the corridors. Svoboda and Pravy Sektor sent two or three people to see what is going on, but the students said: “We are apolitical, what is here that would interest you?” So they left. However, during the third night two buses with about fifty Svoboda-supporters turned up outside the Ministry. They were waiting for the orders from above to attack the occupied building (as they had done with ministries that had been taken over by other groups, e.g. the Ministry of Agriculture). They wanted to take the files. In the end, they did not attack, but the self-defense forces were up all night. A group of fifteen football fans from Arsenal Kiev, the only left-wing ultras in the Ukraine (“big guys, most of them are vegan, and they read books from Marx etc.”), came and stayed for the rest of the week supporting the defense of the building. The self-defense group took part in the student meetings but did not tell the students what to do, but just gave advices and made comments. Their main aims were to make sure that the students could self-organize and control their struggle and to keep the right-wing groups like Svoboda and Pravy Sektor out. Employees came again after some days, shouting slogans outside, demanding to be let in so they could work, but the students did not allow them in. During the whole week, the students discussed their demands. There were some right-leaning students, but not many. The demands were put out to the new government, including the monitoring and publication of the Ministry’s accounts and more forms of self-management for the students. After a week the new government accepted all the demands and signed an agreement in front of the media and witnesses. After that the students left the building. The activist says that, of course, this was also a show, and the new government will not comply with all the points they agreed on. However, the monitoring is going on, and he sees the whole action as a big success as the students successfully kept up the self-organized occupation, did not allow Svoboda or other right-wing forces to intervene and forced the government to sign the agreement. It was his first occupation of this kind, and, in his words, a great experience. The Maidan-uprising put the opposition parties in power, which lost no time and established many of their oligarch supporters as governors or mayors in several regions. The economic situation seems at least as grim as before. Many people are unemployed, and they have just the choice between migrating elsewhere (as construction workers to Russia, as domestic workers to Italy, Spain, Poland…) or take jobs without contracts or social benefits. Many state employees, like teachers or doctors, have very low wages, etc. The working conditions in the mines and factories are bad, the equipment outdated, the number of accidents high. In exchange for the financial support from the EU, the US, and the IMF the new Ukrainian government had to announce reform packages that include the usual measures: budget cuts, dismissals of state employees, welfare reductions etc. Furthermore, the energy prices went up (partly due to the higher gas and oil prices for Russian imports), tickets for the private buses cost 30 percent more in Kiev, and the currency hryvnia lost more then one third of its value towards the euro and the US-dollar, adding to price hikes for import goods. Obviously, there is also a geo-strategic aspect in the Ukraine crisis. Since its independence in 1991 Ukraine was seen as within the influence sphere of Russia, even when other former parts of the Soviet Union were integrated into the EU and NATO (like the Baltic States) along with former countries of the Eastern Block like Poland, Romania etc. In Ukraine, the changing rule of presidents and parties that were either linked to the Western or the Eastern Ukrainian elites did not change that, despite attempts of US- and EU-governments to strengthen the Western influence. The support of the Maidan-movement by forces from the EU and the US and the subsequent regime-change must be seen as a new attempt to pull the Ukraine into the Western influence sphere, restructure its economy and open it up for Western investment… and possibly establish it as another NATO-member bordering Russia. The annexation of Crimea shows that the regime in Russia is not willing to let that happen without any counteractions. The current “semi-war” situation allows further nationalist propaganda by the Ukrainian government as well as the separatists in Eastern Ukraine and offers distraction from the attacks on the living standard of all Ukrainian workers. The Yanukovich government was too weak to carry out austerity measures, the new government is forced to carry them out, despite its lack of power and a severe political crisis. A student from Kiev University who is involved in developing a database on protests in the Ukraine, told us that the number of protests doubled already from 2012 to 2013 – i.e. before the Maidan movement – and increased again in the first months of 2014. That included social protests like strikes, blockades, etc. Many struggles in workplaces are against dismissals or wage arrears. Several of our interview partners said they expect a further increase in social struggles because of the budget and welfare cuts carried out by the government after the agreements with the EU, the US, and the IMF, but also because during the Maidan-uprising people learned to be more self-confident and self-organize (i.e. in neighborhoods) – a difference to the Orange Revolution when people mostly followed orders from above. Furthermore, now the problems cannot be attributed to the hated Yanukovich-government anymore, but are connected to the very government that came to power through the uprising. On April 9 we went to a protest rally of social workers in front of a government building near Maidan. The 12.000 social workers, including 2.000 administrative staff, are the first to be sacked after the agreement with the IMF. The workers were promised two months with full wage and four with half wage as compensation. A worker we interviewed earns a basic wage of 1,400 hryvnia plus up to 1,300 bonus payments (after taxes), so about 80 to 120 Euros per month (while a room in Kiev costs 1,000plus hryvnia in rent, and food prices are similar to those in Poland and just an estimated twenty to thirty percent lower than in Germany). Most workers are women. They were employed in July 2012 by the old government. That is why the new government now accuses them of being in support of Yanukovich. We talked to a middle aged worker who said he did not take part in Maidan, but now he is on the streets because it is a struggle for “his piece of bread”. However, he said it is ridiculous to say they were in support of Yanukovich. He said the government wants to save 300 million hryvnia with the social workers, which is not much, and it is not attacking state sections that cost a lot more. Some activists of Left Opposition came, read a statement and shouted slogans with a megaphone. The Autonomous Workers’ Union distributed a flyer, showed two placards, “Against the old-new government”, “We want improvements” (an ironic reference to a statement of the government), and shouted “Officials go to prison!” A short verbal argument followed with some protesters who thought that was too radical. At the same time, there were also about one hundred old men in front of the government building, Chernobyl veterans, who staged their own protest. The government wants to slash their privileges (pension, free transport, medical treatment). There was no connection between the two protests, although they happened virtually side by side. Posted on April 30, 2014, in Europe and tagged Ukraine. Bookmark the permalink. 4 Comments. If this analysis is representative of anarchism, I am ready to abandon a Marxism that is capable of nothing but repeating the Kremlin’s talking points.